Melanie Wilmoth and I were eating breakfast in a Shoney’s restaurant just west of Jackson, Mississippi when I got the email. The George Board of Pardons and Parole has refused to grant clemency to Troy Davis. I was shocked. On the other hand, I would have been shocked if the call had gone in Troy’s favor. This really is a case of the irresistible force meeting the immovable object. How could the Board fail to grant clemency in a case riddled with so much ambiguity and uncertainty? How could they refuse to do the right thing after so many public figures had publicly expressed their grave doubt about Troy’s guilt? Then again, how could the Board have ruled differently? The tear-stained faces of Officer McPhail’s family were hard to ignore. These people are convinced that their loved one was gunned down in cold blood by a man who has spent the past few decades eluding his just fate. It would be a travesty, they told the board, if a convicted murderer was spared from his rendezvous with the needle. Justice demands a killing, they seemed to say. The conservative perspective in this case has always emphasized the repeated refusal of appeals courts to toss the jury’s original verdict. Surely this means that the most objective and responsible people in the justice system are convinced that Davis is guilty as charged. Actually, it means nothing of the sort. There is no way of knowing who killed Mark McPhail. Three jurors now say they could not have voted to convict if they knew then what they know now. Seven of nine eye witneses have recanted their earlier testimony. Many of these people claim that they were coerced and manipulated by investigators eager to nail the killing on somebody. One of the two eye witnesses who has not backed away from their original testimony may be the actual perpetrator. None of this proves that Troy Davis is innocent; but the foundation on which the conviction originally rested have long since crumbled to dust. The Supreme Court ordered an innocence hearing to see if Troy Davis could produce compelling evidence of actual evidence. US District Judge William Moore concluded that Davis hadn’t offered overwhelming evidence of innocence which meant he was still guilty in the eyes of the law. Why didn’ the Supreme Court all for an ambiguity hearing to establish whether the State of Georgia still had enough evidence to convict Troy Davis? There ain’t no such thing as an ambiguity hearing. The state doesn’t need to prove they could convict Troy all over again; they simply had to show that he couldn’t prove he was innocent. If he failed in this endeavor, the original verdict remained in place. Another judge, say a Carter or Clinton appointee, could have ruled differently and probably would have, but Judge Moore was the man asked to make the call. Should Troy Davis be forced to prove he didn’t pull the trigger? Isn’t it reckless to kill a man who may be innocent? Or are these the operative questions? 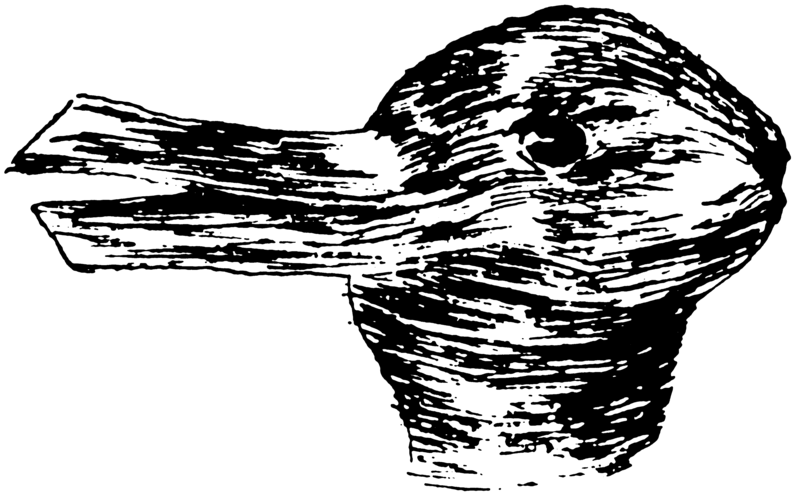 Has the Troy Davis case devolved into a shoving match between people who look at the old duck-rabbit image and draw different conclusions? William Sessions and Bob Barr aren’t saying Davis is innocent; they are saying the evidence is too fuzzy for any objective conclusion to be drawn. Which means that, should the State of Georgia take the life of Troy Davis they are either killing a man who, objectively considered, may be innocent; or they have been caught up on the partisan, ideological, subjective rhythms of a culture war tug-of-war and are determined to see their side win. We are dealing with the equivalent of the subjective question, Did the receiver have control of the ball when he went out of bounds? Fans of one team say he did; fans of the other say he didn’t. But in this case, there appears to be no objective third-party to examine the film. We simply see how many of our people we can put on the Board of Pardons and Parole and lobby for our chosen outcome. Amnesty International, the human rights organization that has done the most to plead for Troy Davis, has never argued for actual innocence. Some of the attorneys associated with the case may believe their man is actually innocent, but they know they can’t prove it. What about the Georgia Board of Pardons and Parole? Are they saying that, as things currently stand, the State of Georgia has enough evidence to convict Troy Davis (or anyone else) of killing officer McPhail? Or are they merely trying to shore up the integrity of a discredited judicial system? What’s the rationale here; that’s what many of us are asking. So, where do we go from here? This thing is far from over. The Governor of Georgia CAN NOT intervene in this case. But the presiding District Attorney in the jurisdiction that convicted Davis could step in “in the interest of justice.” Check out Melanie Wilmoth’s companion post to learn how you can help make this happen. Sorry to say I was right and you were mistaken on this one. We picketed at the federral courthouse yesterday here in Buffalo, NY. It’s depressingly sad, and yet we must take all the enrgy and, yes, hope, generated by Troy Davis and his case and turn it to thew larger fight to do away with the death penalty altogether. Only when it becomes a liability for politicians will they (the ones that favor it and milk it at election time) change their attitude. Meanwhile, let’s pray for a miracle or that some judge with balls will stop this travesty of justice. Thanks for all you do; I much enjoy and learn from your informative pieces and site. Davis probably did it. The only alternative is that a man named Coles did it. Because he was with Coles at the time of the shooting. In that case, Davis, must have known (or strongly suspected) Coles had done it. However he did not come forward to the police the next day to set the record straight and provide information. Instead he left the crime scene immediately, and left town within 24 hrs. Davis never really pointed a finger at Coles, except through the collection of lame affidavits signed by fellow blacks from the same (semi-) criminal environment as himself, many of them convicts, just as Davis was, at the time. He had the chance to make a case against Coles but, by deliberately subpoenaing Coles only a day before the federal hearing in 2010, Davis made sure Coles would never have to take the stand. That’s how weak Davis himself apparently thought the case against Coles was. It is possible that, for whatever reason, Davis took the fall for Coles. In that case he managed to get himself convicted for a crime he did not commit, but also did not prevent, did not tell the police about, a crime he deliberately chose not to help solve, and by acting very suspiciously, by fleeing town. The operative word here is “probably,” as in maybe. We don’t execute people on a maybe, or, if we do, the word “execute” is no longer appropriate. « Troy Davis clemency denied: Take action now!